In Ayurvedic medicine, basil is valued used to holistically support health and also clear toxins from the body. In Chinese Medicine, basil is thought to “lift the spirits” and assist with depression and anxiety, improve the central nervous system, as well as improving the function of the adrenal glands. I love making my own pesto (you can find the basic recipe I used for the Homemade Rye Pasta over here), especially when basil is in season and its flavor is at peak, but I also use store bought, carefully reading the ingredients and choosing organic and preservative-free). 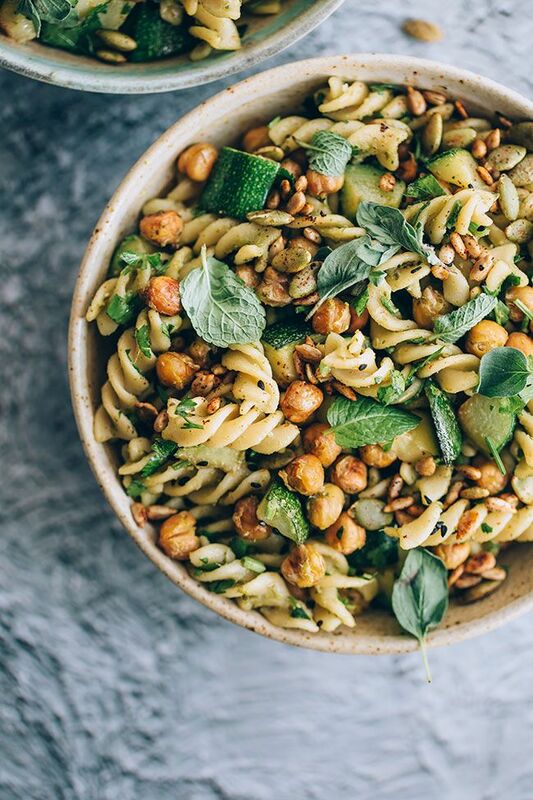 Made with green pesto, roasted chickpeas and loads of green aromatic herbs, this vegan Italian pasta salad makes a filling and protein-rich meal you can make from scratch, or assemble with prepared ingredients from your meal prep sessions. Prepare the pasta according to the instructions. When ready, drain the water, transfer into a large bowl, add the pesto, toss to combine and set aside to cool. Heat the olive oil in a non-stick skillet over low heat, add the garlic cloves and fry for 20 seconds, then add the zucchini cubes. Cook over low heat for 7 minutes, stirring frequently, then season with salt and add into the pasta bowl. Add the rest of the ingredients, and toss to combine.